A new paper in Astronomy and Astrophysics heralds the discovery of a yellow hypergiant star known as HR 5171. Such stars are exceedingly rare, with only 12 such stars known to exist within our galaxy. 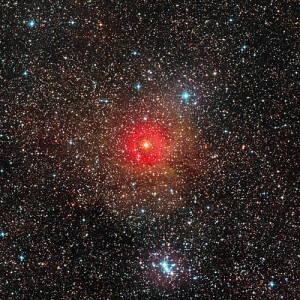 An image of HR 5171. Credit: ESO. A yellow hypergiant star is a very massive, very luminous star. They typically have a mass between 20 – 50 times that of the Sun, but their temperature is roughly similar to that of the Sun. What makes them particularly rare is that they are unstable. They are so bright that their light pushes away the outer layers of the star. Because of this, they are stars in transition. 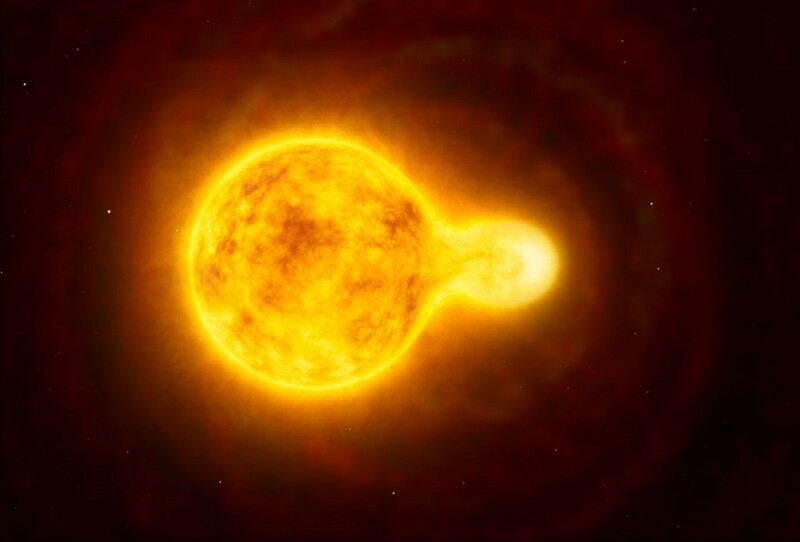 What makes this particular yellow hypergiant unusual is that it is also a binary star. The team analyzed observations of the star and found that it is an eclipsing binary with a period of about 1300 days. This is surprising because the star itself has a diameter about 6 times that of Earth’s orbit. Given its size and mass, the companion star must be so close that they touch, known as an interacting binary. Because the two stars are in contact, they each have an impact on the other’s evolution. The companion can strip material from the primary, and in turn will increase in mass. As the primary hypergiant continues to expand, the two stars will interact more strongly. Needless to say, things could get very interesting for this system. Paper: O. Chesneau, et al. The yellow hypergiant HR 5171 A: Resolving a massive interacting binary in the common envelope phase. A&A 563, A71 (2014).